Pin the Cherry on the Cupcake is a remake of the pin the tail on the donkey game. Ideal birthday party game for children of all ages. I promise it is so easy to draw and colour that you will happily do it yourself. I would never attempt to draw a donkey but a cupcake is simple. All you need is a large sheet of paper and paints or crayons. 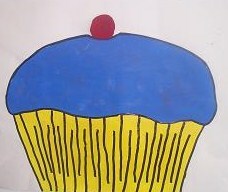 Draw a picture of a cupcake and colour in it. I then use some craft glue to add glitter. You can use stickers, sequins etc to decorate as much as you like. You also need to cut a round shape from a piece of red paper, or even felt, to be the "cherry". Blindfold a child, turn them round three times, then lead them so that they stand just in front of the poster. Put the "cherry" in their hand, with either sticky-tack or sticky-tape attached to it. The child places the "cherry" into the poster where they think it belongs. The blindfold is removed and a tiny circle drawn for the position of the sticky-tack, with the child's initials written nearby. When everybody has had a go, and a few laughs, the child who was closest to the correct position is declared the winner. This is a great birthday party game which is suitable for children of all ages.